‘Reminiscing about Old Age’ – Vignettes from a Care Home – Find You in the Sun – A daughter's slow waltz with her mother's dementia. Oftentimes, when writing about my mother, or working alongside those experiencing dementia, I can easily capture moments of frustrations, blessings and angst. But there is another side to the disease, a softer, funnier side that one can appreciate only after hours spent in a care hour, around residents who are marshaling forth a life others cannot comprehend. Jack and Emma are often found sitting in the white wicker parlor, waiting for the afternoon sun to brighten their day. They chat about residents who walk by. They discuss the weather. Their conversations are at best high-level to the average observer. One day, I happen upon them, as I entered through the secure doors. I always stop and say, “Hello,” as those two friendly open faces help prepare me for whatever situation/disposition I might find my mother in. “What are you two talking about today,” I asked. “Oh, we were just reminiscing,” Emma said. Reminiscing was allowed, encouraged even lifted up as a victory for some shred of a memory that remained. My mother cannot, does not reminsence. Its as if her memory has been wiped clean, though she still knows people who are in her life frequently, or those that have been around since the beginning. “Reminiscing about what,” I asked Emma. Singing is often a focal point, a way into a mind that is road blocked, access cut off to lengthy sentences or meaningful conversations. Confusion about surroundings is not uncommon, even if familiar visitors are around, or more so, especially if those visitors are around. She had been tired, and in true martial law fashion, I had made her get up out of the chair and walk, to find another space where we could visit. We finally made it to standing then walking. But each room she entered was one more she exited. Mom was fidgety and could not settle into any one space or room, as if she was Goldilocks looking for the perfect bed, which she probably was. “I don’t know,” she finally sighed. “Mom, what don’t you know?” I asked. “Well, I don’t know what I don’t know.” Then she squeezed my hand. We laughed out loud together. She knew that she didn’t know what she didn’t know. An unknown author once wrote, “The tragedy of men is that they forget.” But Jim knows exactly who he is. Before long, everyone in the vicinity is singing and carrying that tune with the rest of the day, except me. Instead, I wind up hearing, “John Jacob Jingleheimer Schmidt” stuck in my brain, trying to recall how to spell Jingleheimer. Many still posses the ability to look at themselves and those around, and find commonality. One afternoon, I entered my mother’s kitchen area. Most of the women were finishing lunch or had already completed lunch and were waiting to be taken to the restroom, or helped up from the table. The room, while sunny, took on a strange blue hue. Then, I noticed that all the women were wearing teal, with the lone exception of my mother. I have noted this before. One of the caregivers told me, some days, she picks a color to help her decide how to dress the women that day. The women swung their head around at each other, astounded by the color and the matching. Sometimes, my mother makes sense. During the past weeks of abundant sunshine, I made the extra effort to visit Mom frequently so she too could catch and hold on to the last rays of summer. It is a sadness that sets in for me, to watch the sun fade from her views in the winter months. After much cajoling, I escorted Mom outside for a stroll. We finally exited the shady area and I stood still in the sun. My mother, meanwhile, was focused on a dead leaf she could not move from her path with her shoe. Moments that make me laugh. Moments that take my breath away. As we sat in the courtyard one day, another resident and her brother passed us by. “Hi, Jean,” the brother said. “Hi,” Mom replied, her friendliest tone not used around me, not ever. “Who is that pretty girl you’re there with,” he asked. Moments that I will long remember. 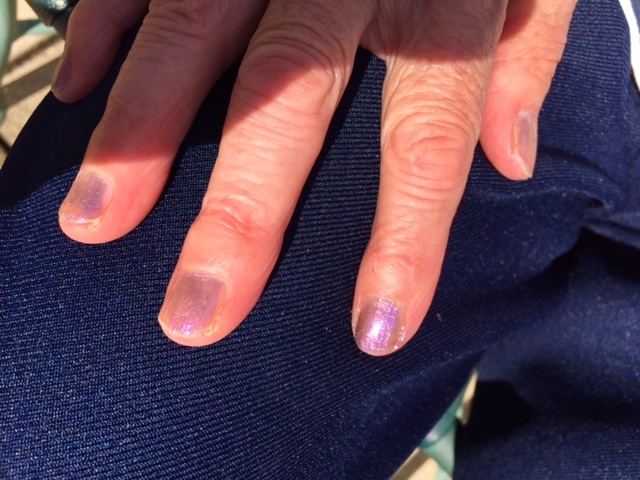 Mom, in her purple sweater with a purple shirt underneath, and nails that I painted purple, just to get her back for always dressing me in yellow when I was a toddler, applauding her memory. When I grow old, I too shall wear purple, like I did as a teen, in my twenties and thirties and now. I shall sit in my writing room, painted a shade of purple called Soulmate, and I will laugh about my memory and hopefully remember to laugh. * Names have been changed to protect the innocent. Mother of course, needs no defending. She is perfectly capable of doing so herself. Thanks Phebe. I do believe in all the wisdom she had imparted these years, with her simple comments or simple actions. Your comments inspired a poem this morning for me, as I am back at the hospital, checking in, feeling as if there is another change coming for her, just one I cannot yet discern. Wondeful, Annette. I find this piece full of acceptance and being in the moment.